The INACCURATE MOVIE REVIEW ensures movies are not spoilt by getting everything wrong about them: A Quiet Place. 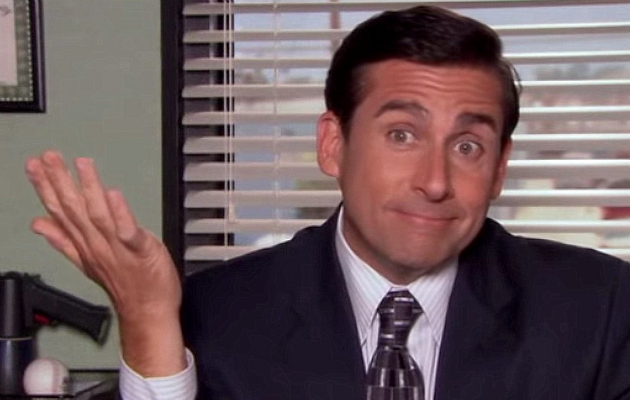 Steve Carell – the star of TV’s Parks and Recreation – stars in a knockabout comedy. Instead of being quiet, it’ll have you laughing as loudly as you can. The 1970s and America is coming to terms with the post-Watergate paranoia. Carell and real life wife Tina Fey play Ernie and Esther, a middle aged couple who live in the city with their dogs and blind son: Georgie. Chris Pratt from The Office plays Georgie very movingly. When aliens invade, the world is turned upside down. But Ernie’s ability to amuse the aliens with his hilarious shadow puppetry means he distracts the aliens while Esther and Georgie escape. Unfortunately, the aliens see Georgie’s luminous stick – they can’t hear him because they are deaf – and they eat him up. Blood everywhere. Jeez, like something out of the Farrelly brothers films, which isn’t surprising as they directed this. Eric finds that the aliens have very keen eyesight – they spotted Georgie’s stick after all, which wasn’t THAT luminous – and he uses this against them by shining the torch from his phone into his eyes. At this point the film could end because we know how Eric and Esther will defeat the aliens, but the film insists on showing us them killing every single alien with torches from their phones.